At first, I thought this was just another race track for little kids. Oh boy, was I wrong. This amazing set is going to get everyone’s heartbeat racing! Boys, girls, dads, moms and grandparents too. It’s the coolest remote control race car track you’ve ever seen! Looks too good to be true? That’s what I thought but I delved into more videos, read the reviews on Amazon and I can tell you that this set by Max Traxxx is the real thing. What’s this remote control race car track all about? It’s a racing track with room for two cars. Both cars are operated using remote controls, so players can race against each other. Sounds good? Wait, there’s lots more! This game requires skill. It’s not just a matter of pushing the handle and getting your car to move forward at top speed. The cars are very fast and can reach 500 MpH. Ok, so they don’t really get to that speed but it is their actual speed relatively to the size of the track. What does that mean? It means that you’ve got to slow down when you reach the curves or your car will fly off the tracks. You may be thinking this game is not for toddlers or very young children. You’re absolutely right, of course, except that they will thoroughly enjoy watching older sisters and brothers play because this remote control race car track lights up the room! Literally! Each car has special lights at the bottom. These lights trigger a fluorescent reaction in the tracks themselves. The result? The cars leave behind a glorious trail of bright greenish light on the track as they travel. Just dim the lights in the room and enjoy the light show! There’s a lot to love about this game. It teaches your kids the basic laws of physics in the most fun way imaginable. It’s also just pure fun and we should never underestimate fun! Max Traxxx offers even more though. Here are a few cool ways to expand on the experience. 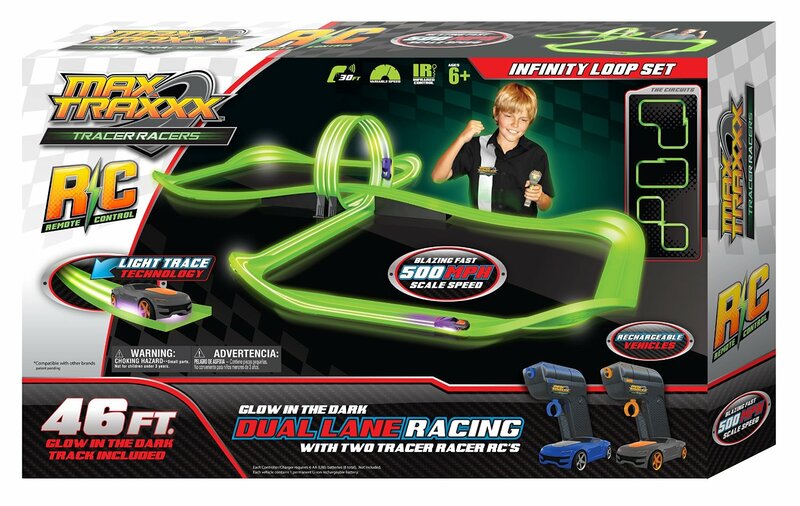 This set includes over 46 feet of glow-in-the-dark tracks, including six corner and a loop. If your kids adore the remote control race car track concept, you can add to it by ordering additional tracks. You can add to the original set and create a huge tracking arena in your living room. Don’t worry, it’s all easy to put together and then take apart for storage. You can also add more cars to your collection. Why stick with just two car designs? Order more for even more choice when you race. You can easily order more cars to see how different designs affect your “driving” ability. Your additional cars don’t have to be controlled by a remote control. Max Traxxx also offers models that you can wind up, release on the tracks and watch gravity do the rest. That’s not a bad option if you want to let younger kids play without the added pressure of having to “drive” these fast cars. 3. Create your own car! Yes! Max Traxxx also offers state-of-the-art crafts projects! 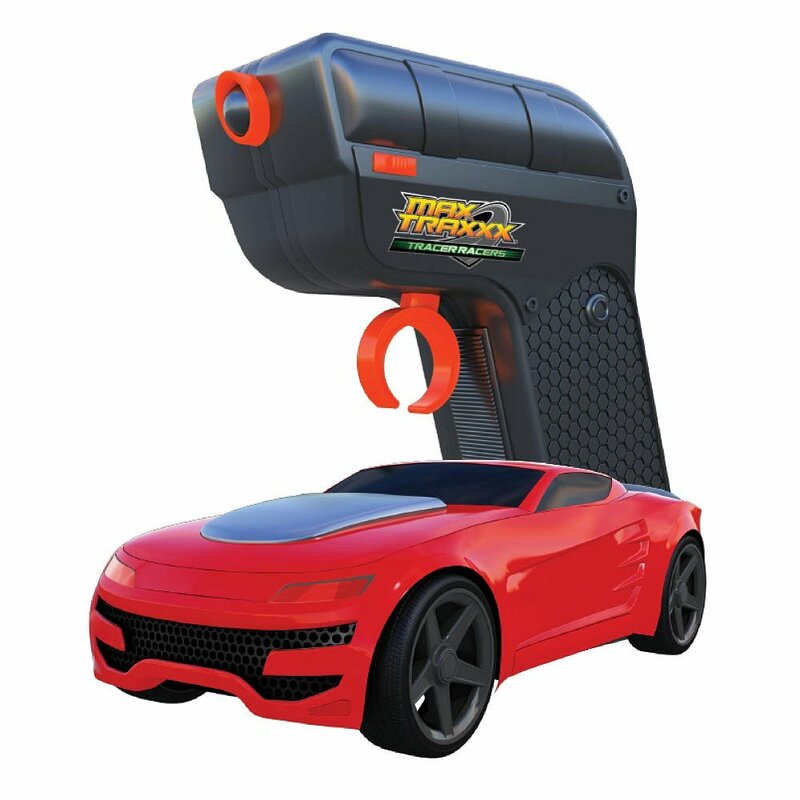 You can get a pre-cast car and just add the decorative stickers or you can go all the way and cast your own car! This is a wonderful project for parents and kids to work on together. It includes the PerfectCast mix, reusable molding trays, paints & paint brush, custom decals and of course, axles and wheels. These are not remote-controlled cars, neither will they light up the tracks. However, they are true to the original car models and kids and parents will be happy to create and collect them! Check out this perfect yellow chevy! Reviewers say that the price is Amazon is half the price they found on local stores, so along with the amazon customer satisfaction guarantee, this one is a winner! Click here to see the reviews and read everything about the Max Traxx set and order your own. Amazing!..Great for an evening get together..